James BOSHERS was born in 1785. He died in 1850. James married Elizabeth. Elizabeth was born in 1788. She died in 1850. Elizabeth married James BOSHERS. F i Mary "Polly" BOSHERS was born in 1810. She died after 1870. John Hunter HOLLINGSWORTH "Sr" [Parents] was born on 17 Oct 1867 in Paterson, Passiac, New Jersey. He died in Jan 1944. He was buried in Greenwood Cemetery, Brooklyn, New York. John married Harriet Frances CURLEY about 1889. Harriet Frances CURLEY was born in New York City, New York, New York. She died in Oct 1933. Harriet married John Hunter HOLLINGSWORTH "Sr" about 1889. William Mills FORSYTH was born in 1864 in Belfast City, County Down, Ireland. He died on 26 Feb 1936 in 2 Temple Crescent, Blackrock, County Dublin, Ireland. William married Charlotte Elizabeth HOLLINGSWORTH about 27 Nov 1899. Charlotte Elizabeth HOLLINGSWORTH [Parents] was born on 8 May 1868 in No. 1 North City, City of Dublin, Ireland. She died on 2 Apr 1949. Charlotte married William Mills FORSYTH about 27 Nov 1899. F i Florence Mills FORSYTH was born in 1902. M ii Harry Hollingsworth FORSYTH was born on 18 Dec 1903. He died on 19 Jul 2004. Rev. Robert MOORE. Robert married Myra Frances HOLLINGSWORTH. Myra Frances HOLLINGSWORTH [Parents] was born in 1871 in Near Dublin, Dublin, Ireland. She died in 1899. Myra married Rev. Robert MOORE. James WARREN [Parents] was born on 6 Aug 1824 in , County Wexford, Ireland. He died on 21 May 1884. James married Mary Ann HOLLINGSWORTH. Mary Ann HOLLINGSWORTH [Parents] was born on 15 Nov 1832 in Leinster, County Wexford, Ireland. She died on 13 May 1918 in Junetown, Leeds County, Ontario, Canada. She was buried in Junetown, Leeds County, Ontario, Canada. Mary married James WARREN. M i James A. WARREN was born on 18 Dec 1856. He died in 1912. F ii Catherine "Katie" WARREN was born on 18 Aug 1862. She died in 1932. M iii William John WARREN was born on 15 Nov 1870. He died in 1947. WATKINSON was born about 1870 in , , England. WATKINSON married Catherine "Kate" HOLLINGSWORTH. Catherine "Kate" HOLLINGSWORTH [Parents] was born on 25 Jun 1873 in Ballvmena, County Antrim, Ireland. She died in 1899. Catherine married WATKINSON. Damon Nicholas CHURCH [Parents] was born on 26 Jan 1907 in Alexandria Bay, Jefferson, New York. He died on 3 Apr 1987 in Lakewood, Jefferson, Colorado. He was buried in Alexandria Bay, Jefferson, New York. Damon married Mary Katherine HARDIN. Mary Katherine HARDIN was born on 17 Jul 1915 in Tarry, Lincoln, Arkansas. She died on 1 Jun 1959 in Ashville, Buncombe, North Carolina. She was buried in Ashville, Buncombe, North Carolina. Mary married Damon Nicholas CHURCH. Nicholas James HOLLINGSWORTH "Jr" [Parents] was born on 16 Apr 1880 in Sheldon's Corners near Athens, Ontario, Canada. He died on 12 Jun 1960 in Edmonton, Alberta, Canada. He was buried in Edmonton Cemetery, Edmonton, Alberta, Canada. Nicholas married Florence Lucinda MILLER on 28 Feb 1906. 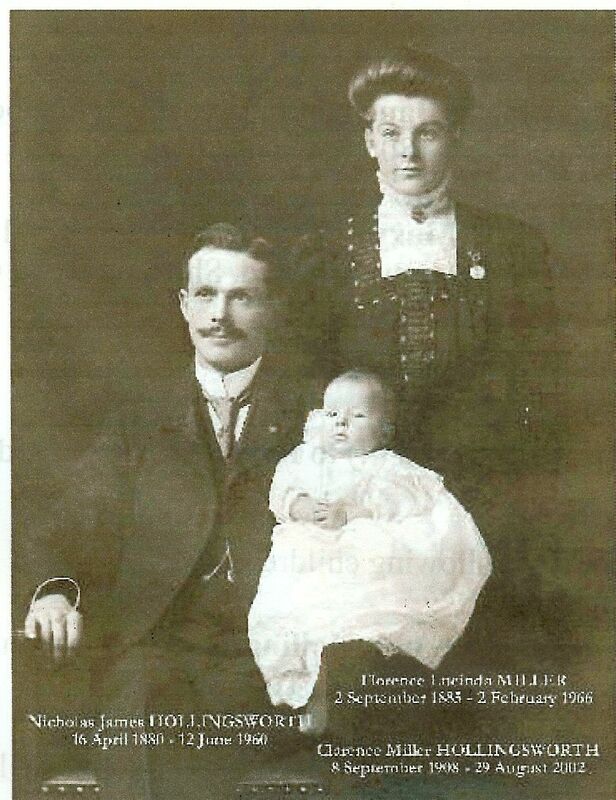 Florence Lucinda MILLER was born on 2 Sep 1885 in Greenbush, Ontario, Canada. She died on 2 Feb 1966 in Edmonton, Alberta, Canada. She was buried in Edmonton Cemetery, Edmonton, Alberta, Canada. Florence married Nicholas James HOLLINGSWORTH "Jr" on 28 Feb 1906. M i Clarence Miller HOLLINGSWORTH was born on 8 Sep 1908. He died on 29 Aug 2002. Carl HOLLINGSWORTH was born on 28 Mar 1911 in Edmonton, Alberta, Canada. He died on 8 Jul 1912 in Edmonton, Alberta, Canada. F iii Lorna Geraldine HOLLINGSWORTH was born on 3 Mar 1913. She died on 8 Dec 2003. M iv Ralph Nicholas HOLLINGSWORTH was born on 27 Dec 1920. He died on 22 Nov 2000. Gordon HOLLINGSWORTH [Parents]. Gordon married Margaret. Margaret. Margaret married Gordon HOLLINGSWORTH. David John HOLLINGSWORTH [Parents] was born on 15 May 1885 in Athens, Leeds, Ontario, Canada. He died on 6 Jun 1959 in Coquitlarn, British Columbia, Canada. David married Mary Isabel Edoyle BENNETT on 26 Oct 1912. Mary Isabel Edoyle BENNETT was born on 28 May 1886 in Toronto, Ontario, Canada. She died on 17 Nov 1973 in Winnipeg, Manitoba, Canada. She was buried in Winnipeg, Manitoba, Canada. Mary married David John HOLLINGSWORTH on 26 Oct 1912. F i Marion Goldie HOLLINGSWORTH was born on 10 Mar 1913. She died on 4 May 1974. John Lyman HOLLINGSWORTH was born on 26 Feb 1915 in Winnipeg, Manitoba, Canada. He died on 12 Aug 1979 in Winnipeg, Manitoba, Canada. F iii Margaret Patricia HOLLINGSWORTH was born on 29 Dec 1917. She died on 6 Jan 1998. F iv Mary Eileen HOLLINGSWORTH was born on 6 Oct 1920. She died on 18 Mar 2013. F v Elizabeth Mary HOLLINGSWORTH was born on 7 Dec 1924. M vi Carl HOLLINGSWORTH was born on 26 Nov 1926. F vii Iris Doreen HOLLINGSWORTH was born on 8 Oct 1930. She died on 20 Jul 1956. F viii Shirley Marie HOLLINGSWORTH was born on 7 Nov 1932.